Along with his love for coaching football and playing video games, my hubby also has a passion for directing and editing videos, which is a good thing, since it also happens to be what he does for a living. He has recently combined these three areas of expertise, and begun a You Tube video series called “Anatomy of the Game”, where he uses the Backbreaker video game to coach football technique. At this moment he has three videos up, and is working on the fourth as I type. It’s really neat, and he does a wonderful job! Check him out at http://www.youtube.com/user/newberry94005. And just to whet your appetite, here’s his trailer. Now, on to the crafting! Instead of doing a How To for this project once I have completed it, I have decided to chronicle my progress as I go, since it is such a large project. We will all find out together if it turns out well in the end! For starters, I came up with a design. As I said in Keeping The Memories, I liked Julee’s design so much I used it as inspiration. 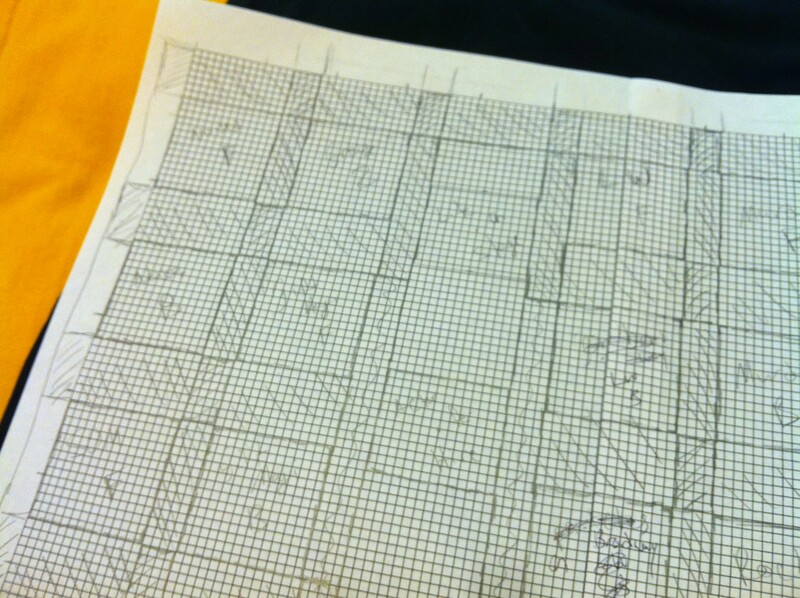 After printing out a few pages of graph paper, and taping them together, I drew up my design using queen size comforter dimensions as a general guideline. Once I had all of my piece measurements worked out, and not forgetting to add a bit for seam allowances, I measured and cut out some cardboard templates to use for the multitude of pieces that will have same dimensions. After washing and drying my tee shirts and blue jeans, I ironed on some interfacing to the insides of the front and back of the tee shirts before using one of my templates to cut out 14″ x 14″ squares from each side. 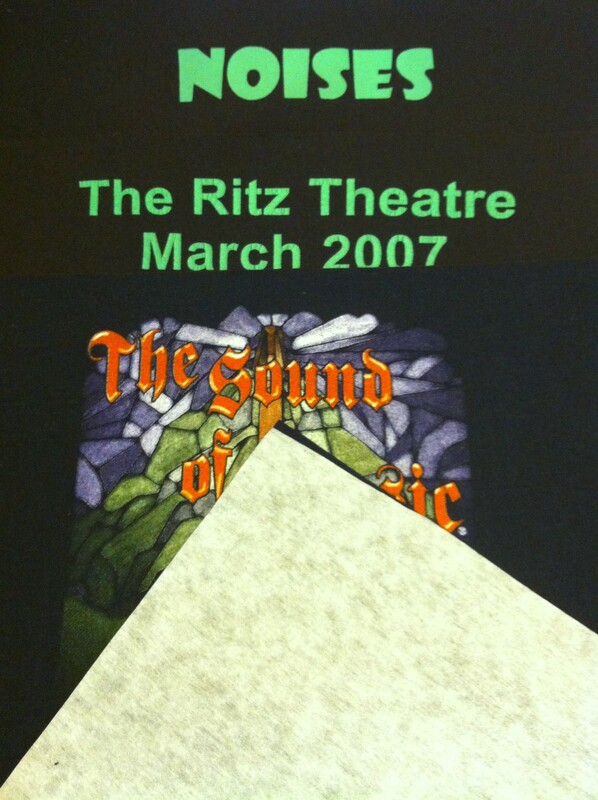 Front and back of both “Noises Off” and “The Sound of Music”. Some of my older pairs of jeans that have also mysteriously gotten too small to wear will supply the rest of the fabric in the pattern. Included with these jeans is a pair that I wore as part of my costume in “Godspell”, my first college production. 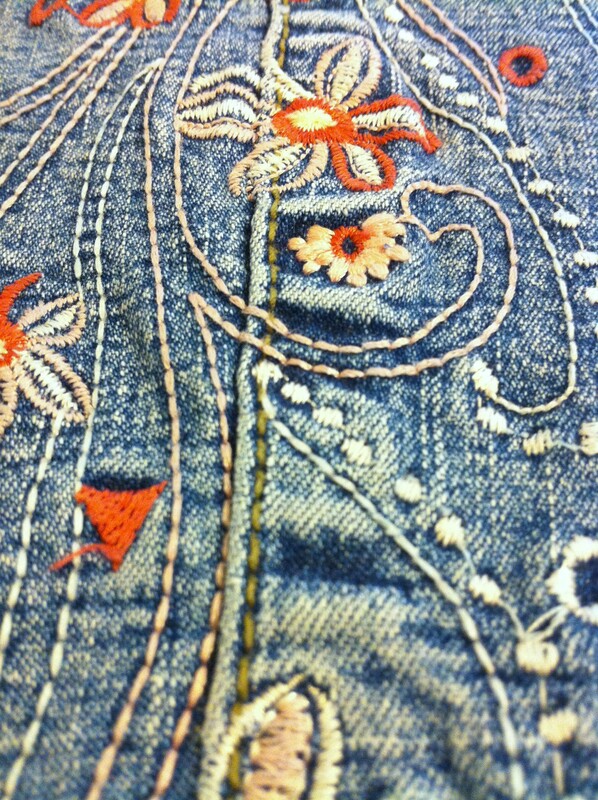 These jeans have a an awesome embroidered design all the way down the outside of both legs, from the hip to the ankle, and they’re going to make a great addition to the quilt. I wore these jeans with a pink and red horizontal striped shirt and a pair of bright red sneakers. Oh, what fun! Yay for good memories! And what a great way to preserve them. Thanks to Julee for putting a bit of fire under my bottom to get the project going. I’ll have more updates as things progress.